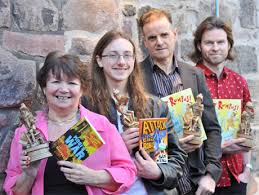 Scottish Children’s Book Awards – The Results! I had a fantastic time yesterday at the Scottish Children’s Book Awards ceremony in Edinburgh. The Older Readers event took the form of a quiz, which was hotly contested by the 200 or so pupils taking part. I humiliated myself by getting a question on my own book wrong, but at least it gave everyone else a laugh! The category was won by Cathy MacPhail for Mosi’s War, and William Sutcliffe (The Wall) and I (Dark Spell) were runners-up. If you follow the link here you can find out about the winners of the other categories and more about the award in general. It was a treat to meet so many enthusiastic readers from all round the country, and find just how many pupils have been involved – 28,643 of you voted altogether! Apart from reading the shortlisted books, many had entered the review or trailer competitions. I hope to include a link to the winning trailer, which was for Dark Spell, in the next few days. If you are a school pupil reading this and you didn’t take part this year, nag your English teacher or librarian to help you get involved next year! You’ll have a great time. Looking forward to seeing that trailer – and congratulations on being part of it all!